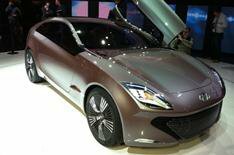 Geneva motor show 2012: Hyundai i-oniq | What Car? This is the Hyundai i-oniq concept car, which will make its debut at the 2012 Geneva motor show. Hyundai describes the i-oniq as an electric sports hatchback with a range-extending petrol engine that showcases the latest thinking from its designers and engineers. The i-oniq is powered by a 108bhp electric motor and lithiumion batteries. Theres a 1.0-litre, three-cylinder petrol engine that acts as a generator to charge the batteries, giving a maximum range of 435 miles and CO2 emissions of just 45g/km. Using electric power alone, the i-oniq has a claimed range of 75 miles. At 4.4 metres long, the i-oniq is a few centimetres longer than a Ford Focus and 10cm longer than the new i30. Hyundai describes the i-oniqs roof which has an extended glass area as a penthouse roof. There are LED headlights, too, while the interior has four seats and sculpted surfaces inspired by musical instruments. Hyundai has recently launched the new i30 and i40 models, while the Hyundai i30 Tourer makes its debut at the Geneva show. Hyundai sources confirmed to us that the i-oniq doesnt preview an upcoming new model. A replacement for the Santa Fe expected to be called ix45 is due later this year, but it wont look as sporty as the i-oniq.